Professional leak detection is just a phone call away when you contact Torrance Plumbing and Rooter Company. 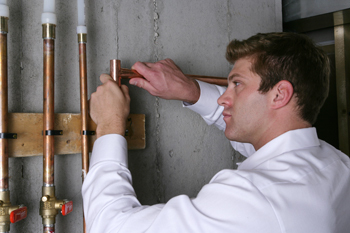 We are a leading plumbing company in the area that connects homeowners and businesses with qualified leak detection specialists. Whether you have an issue with a leaky shower, need slab leak repairs, or want to schedule an appointment for routine maintenance, you can depend on our crew of independent contractors to get the job done right the first time around. Get ahead of disastrous leaks and take action now! Our customer service representatives are available 24 hours a day, seven days a week eagerly waiting to take your call. Sometimes water leaks are unavoidable. Other times simple preventive maintenance like paying close attention to leaky water heaters can head off most problems. Whatever the situation may be, our trusted contractors can help. What causes plumbing leaks? This is the number one question that we are asked on a daily basis. There is any number of reasons for water seepage to occur. Clogged drains and stopped up toilets can put pressure on pipes causing them to weaken and leak water. Pipe deterioration is another reason for chronic problems. Inadequate irrigation and a poorly sloped yard can also cause water to pool near foundations, and if there are cracks in your slab, this is the perfect environment for leaks to form. When you call for professional leak management and inspection services, our highly trained plumbing partners will analyze the situation thoroughly. Their attention to detail and innovative inspection methods makes it possible for you to know exactly what needs to occur to stop the water from creating damage to your home or building. Do you have a below-ground leak? Give us a call today and let us introduce you to our state-of-the-art electronic leak detection services in Torrance, California. This manner of identifying and repairing slab leaks, pool leaks, and other water issues in your home is non-invasive and cost-effective. Instead of tearing up your concrete slab or excavating the yard around your pool to find the exact location of the problem, this method of detection allows our contractors to find the problem without a pointless mess. Call us today and let us introduce you to our innovative leak detection services!